Don't worry, friends! The hundreds of dollars you've spent on fart apps will not have gone to waste with the iPad: it can fart, too. Just smaller, and in the middle of the screen. The iPad can run "virtually every one of these apps, unmodified, right out of the box." They can either run it very small, 1:1 pixel, in the center of the screen. Or they can "pixel double" it and run it full screen, in a low resolution mode. 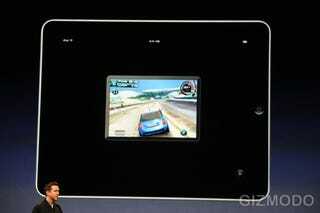 For new apps, however, Apple is releasing a new SDK for apps with special interfaces for the iPad.